I searched for this suggestion, but found nothing that suggests only Name Tag recipes or gave any details on the recipes. So I made this thread. As of now, Name Tags can only be obtained via dungeon chests, Creative mode, or inventory editing. Personally, I feel that going through the trouble of finding one of the extremely rare dungeons just for an aesthetic addition is ridiculous. 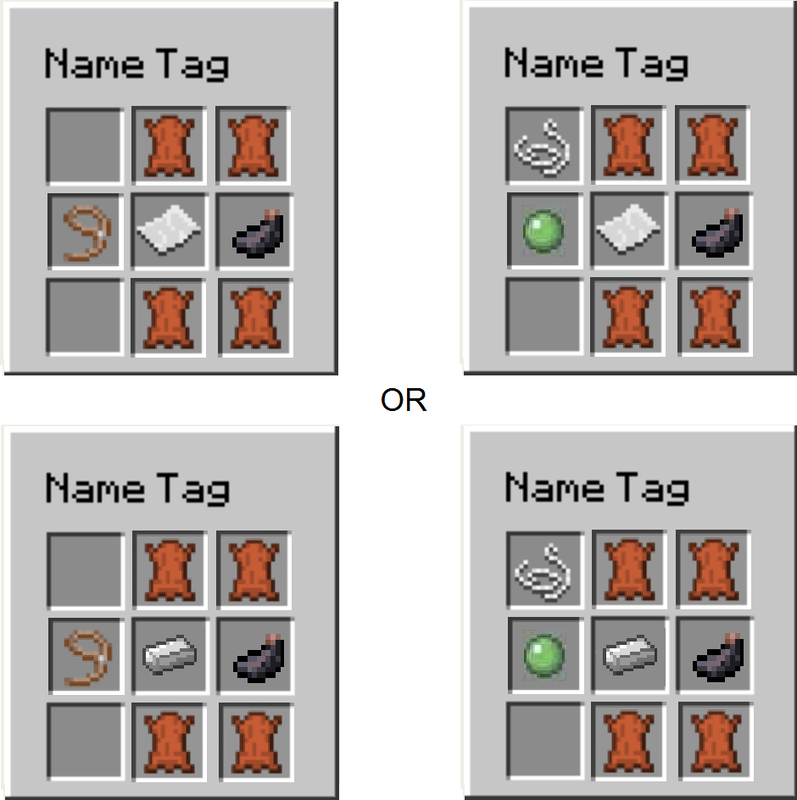 Therefore, I feel that the Name Tags should have a crafting recipe. It wouldn't be too difficult to craft one, since all it does it add a name to mobs you use it on. Note that you could still find Name Tags in dungeon chests, for players who don't want to spend their materials on naming their pets. all it does it add a name to mobs you use it on. It also makes the mob not despawn, and can make them flip upside down by naming the mob "Dinnerbone". May have some balance issues, but I'm not sure. 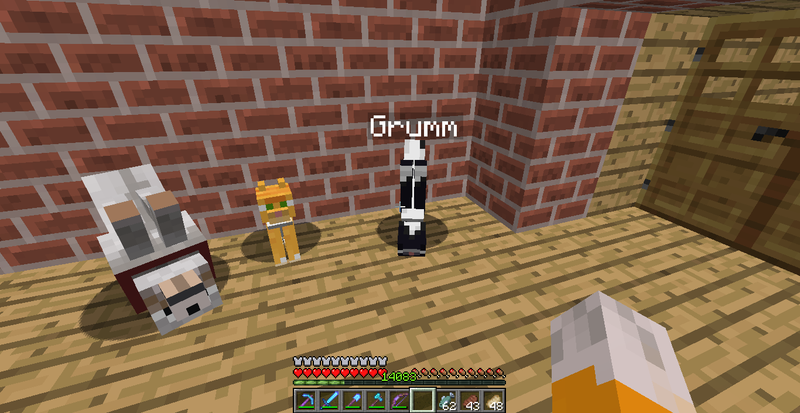 You can name mobs Grumm and they will turn upside down. I also don't feel that name tags in their current state are worth the trouble. Support! Edit: Wait a minute... this thread dated all the way back to August 2013! I agree that they are currently too rare for what they do, but I don't think you should be able to craft them, especially not that cheaply. Nametags don't only name a mob, they also prevent it from despawning. And you wouldn't want players with mob grinders and sugarcane farms to mass name every mob they see to lagg out the server. Maybe it should be a very rare drop from farm animals or something. I feel like it needs to have some sort of challenge to it. Maybe add like ink, or a slimeball? Just tossing around ideas here. Oh jeez. I just realized it was a necro. It's not as bad as when some random guy ressurects a suggestion from like 2011 saying "this exists already". I lol hard when that happens. How does this thread currently have only 13 comments, but over 13,000 views? I half agree half disagree with this. Yes they should be added to make it more accessible because having a name tag easy to access doesn't really change the balance of anything such as combat, and progress in the game, it's simply naming you're pet or whatever so you know which is which. But then again it's not that hard to find with surface dungeons still very commonly found in deserts and can be found with multiple of them in a single chest. I found a seed with 260+ dungeons and from the first 180 of them i had over 100 name tags. Take that ratio and assuming all dungeons had 2 chests there would have been a 1 in 3 chance of them having a name tag in it. I think maybe if you changed the recipe (Perhaps having 1 string rather than 3), this might be a pretty good idea. There. Not too expensive but not ridiculously cheap. If anything, I wish it would be made with iron. Iron because I'm used to those metallic military name tags. I'm not against Name Tags becoming craftable. Is there a reason they aren't craftable though? I recall them making mobs not despawn which could cause lag, worst case scenario.